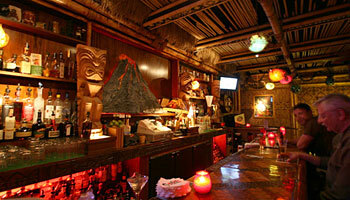 The Kona Club is a nice little Tiki Bar with quite an atmosphere depending on the night you go. I recommend checking out. They don’t seem to have a Happy Hour of any sorts but it’s still pretty chill. They have a plethora of mixed drinks here, also a pool table and sometimes you can even find food vendors outside. They are located down Piedmont Ave on the corner of Pleasant Valley Rd. right before the cemetery. Here is a short video they put together to show how fun it can be.